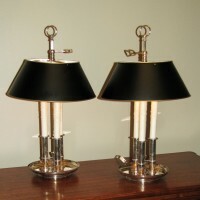 French pair of heavy silver plated bouillotte lamps with black tole shades. Dimmer switches on French style fabric covered cords. Marked “CF Plague”. Attributed to Charles et Fils Paris.